Game Of Thrones is the latest HBO show to score a casting coup, gathering an immaculate 50-some-odd recurring ensemble of women with perfect skin, men with perfect beards, and children who match them in every scene. Casting directors Nina Gold and Robert Sterne (twice nominated for Thrones), along with showrunners David Benioff and D.B. Weiss, seed the series like a garden box, planting well in advance of an expected harvest. New arrivals in season two like Natalie Dormer’s sociable Margaery and Gwendoline Christie’s loyal Brienne really started to fly in season three. Even Kit Harrington finally found some humanity, almost matching Rose Leslie’s earthy Ygritte as their relationship heated up. All of which may sway Emmy voters, but the casting Emmy is technically awarded for the season’s new casting—and season three sure didn’t skimp on new faces. As co-creator Weiss put it, “We’re casting more than we’re killing.” And even when the show is killing, sometimes it’s resurrecting. 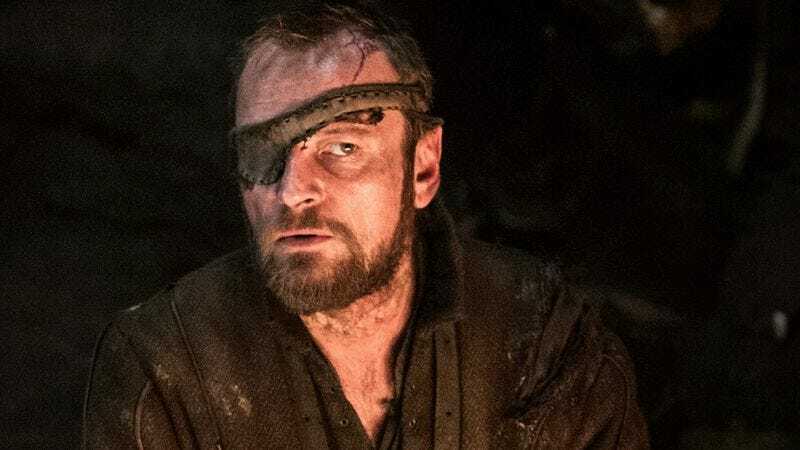 The recasting of season-one nobody Beric Dondarrion comes with a wink when he shows up in a new body (Richard Dormer) after having died several times off-screen. The season is full of Beric Dondarrions, people crawling out of the shadows, as in Mance Rayder’s man-behind-the-curtain revelation or Shireen Baratheon’s delicately lit and choreographed introduction. We meet the Tullys in a rich, beautiful once-over, we meet the Bolton men one by one in all their violent creativity, and we meet the Stannis Baratheon household when the king remembers his practically unmentioned family locked away in their catacomb suites. Point-of-view character Arya gets caught up in the Brotherhood Without Banners, while Jon gets initiated into a motley crew of wildlings. Across the sea, Daenerys cobbles together a whole council of advisors. Dame Diana Rigg’s Queen Of Thorns comes to the capital personally to get a read on all the people surrounding her granddaughter now that she’s betrothed to the king. And that’s to say nothing of the spot-on third-tier characters, like Littlefinger’s special-occasions gigolo informant. Casting on Game Of Thrones tends to be vindicated down the line—Ciaran Hinds in particular feels like a jack still in the box—but some of these new additions are already paying rent. Rigg’s Lady Olenna is so witty, formidable, and decent that her every scene sings: interviewing a scared stranger about the king’s cruelty; going mano a mano against each of the power players running the monarchy; displaying her feminist cred for the right-wing first lady and thereby planting a little seed of rebellion. Comedian Paul Kaye is an inspired choice to play drunken priest Thoros Of Myr, but he nestles inside that cynic and pours out his heart with the best of them. When Thoros talks about seeing miracles in the world, it’s a moving speech, but it’s also the first time in three seasons that someone has translated Westerosi worship from supernatural silliness into real-world religion. In Kaye’s hands, an important piece of Game Of Thrones culture finally makes sense. Then there’s the way the casting contributes to the medley of flavors on this purposely scattered show. Here’s an odd-couple sketch about bumbling soldier Edmure (Tobias Menzies) and the uncle (Clive Russell) who can barely abide him. Next there’s a prophetic vision quest aided by mysterious runaways (Thomas Brodie-Sangster, Ellie Kendrick). After that, there’s a Dark Shadows episode about a fanatical queen (Tara Fitzgerald) and the girl with the dragon skin (Kerry Ingram) living in the shadows while their patriarch broods over how to seize power. And those are just subplots. Kaye, Richard Dormer, and Philip McGinley’s archer, Anguy, make for pragmatic Merry Men showing traumatized youth Arya that maybe the world isn’t so black and white, but Daenerys’ slave revolt is a lot less gray, and the Slaver’s Bay recruits (Dan Hildebrand’s misogynistic Master Kraznys, Nathalie Emmanuel’s girl-power Missandei) follow suit. Hildebrand and Theon torturer Iwan Rheon both twirl their mustaches, but they do so as differently as apples and sausages. Hildebrand plays a gnat to be swatted away triumphantly, so we can move on to the real bad guys, but Rheon’s monster spends a few episodes pretending to help Theon, setting the stage for his big betrayal. Not only does that play as a serious narrative hint about the season, but it also lets Rheon show some depth before his cartoon heel turn. It takes all kinds to populate Game Of Thrones. It takes action figures like Jacob Anderson’s Grey Worm. It takes promising caterpillars like Brodie-Sangster. Mostly, it takes character actors who could have believably survived this fierce world, from Mackenzie Crook’s Orell spinning his oddness into menace to Noah Taylor’s Locke bringing his whole nasty, brutish life to bear as he lords over the closest thing to the season’s heroes. (And it never hurts to have a ringer like Bart The Bear.) For the past two seasons, Golde and Sterne have lost to big-name freshman series Boardwalk Empire and Homeland. But with all its modes and styles, not to mention the gambles on newcomers, Game Of Thrones has a taller order and a subtler way of filling it. The cast may be an unlikely mix of performers, but the combination is pure alchemy. See more content like this on "Season Three"